The Project Island Song partnership, made up of community group Guardians of the Bay of Islands, local hapū Ngāti Kuta and Patukeha and DOC, teamed up with Kerikeri Shade House volunteers for a busy day on Tuesday 13th June. I have just been reminded of how proud I am to work for DOC—and in conservation. That’s because I had the unique opportunity to travel the length of the country to film a variety of community conservation projects. My travels took me to almost every region in New Zealand. Not only was I inspired by the conservation projects I filmed, but I also met an incredibly diverse bunch of amazing New Zealanders—DOC staff, business people, young ambassadors, tireless volunteers, community leaders, philanthropists, conservation-minded farmers and forestry workers, and a variety of passionate organisational partners. These people shared their working life with me, and some also welcomed me into their homes—people like Gareth and Jo Morgan (thanks for the scooter ride, Jo), Guy Trainor from Kaiteriteri MTB park who tested my skills on the Corkscrew, the lovely Kate Akers of Landcare Trust (you are wunderbar), the tireless Fleur Corbett and Helen Ough Dealy from DOC in the Bay of Islands, and my good friend Ruth Barton in Auckland. The video showcases DOC’s vision for the future—more people involved in community-owned conservation projects. Dulux has just announced a new three-year partnership with DOC—you may have seen the TV advert. In short, Dulux is supplying DOC with paint to spruce up huts and other structures around the country. I interviewed Murray Gray, Dulux’s trade store General Manager. He’s a down-to-earth guy—loves the backcountry and hunting, and helped paint Tarn Ridge Hut that features in the ad. Just after lunch I filmed Wayne O’Donnell of Greater Wellington Regional Council. Wayne is part of Nature Central, a partnership between three regional councils and DOC, who aim to work together to make better use of resources, and work on joint projects including education and training initiatives. 16-year-old Natasha Bishop is the talented young woman behind the simple yet very effective animated video ‘Arboraceous’, which won the Outlook for Someday 2012 competition. Devon McLean (Chairperson of Project Crimson, and now Manager of Project Janszoon), and Wildlife Manager Pete Gaze were my hosts at Anchorage in Abel Tasman Park. 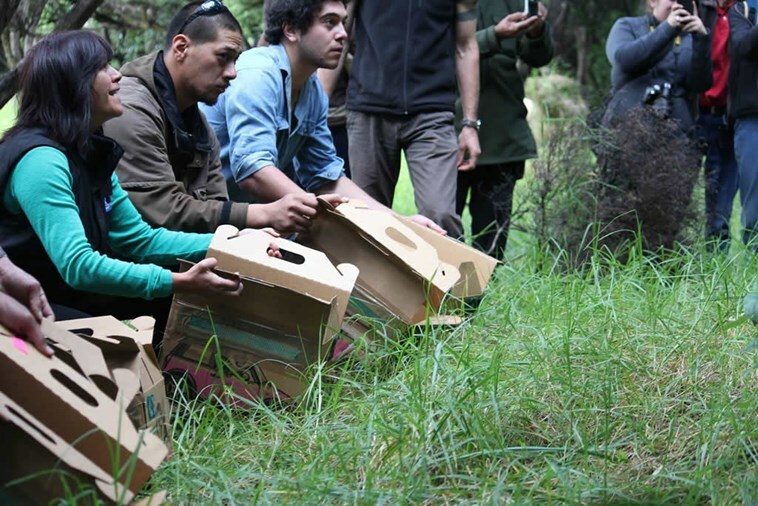 Conservation in the park has been boosted by a $25 million project (over 30 years) launched by a Kiwi family who wish to remain anonymous (‘Janszoon’ was Abel Tasman’s middle name—not the name of the family). On Sunday morning I filmed a working bee organized by Kaiteriteri MTB park Project Leader Guy Trainor. The group has built over 20 km of tracks in the back of popular holiday town Kaiteriteri, all through volunteer labour. Guy’s passion for the project is infectious. 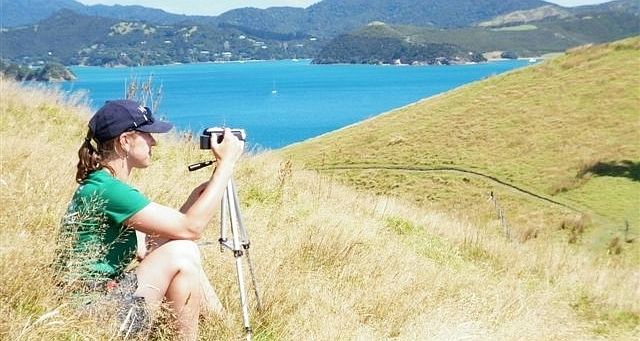 In Tauranga I filmed a field trip organised by the formidable Kate Akers of NZ Landcare Trust. 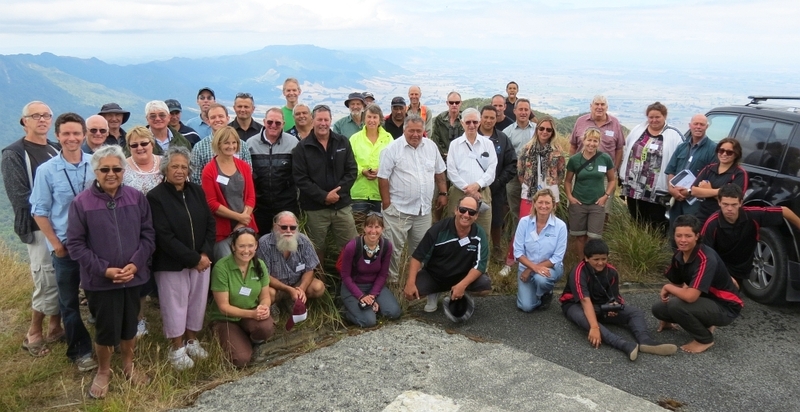 The bus trip consisted of a diverse group of people that make up the Kaimai Catchment Forum (including regional and district council members, Federated Farmers and kiwi fruit orchardists, iwi, conservation trust leaders, Forest and Bird reps, DOC and others). The day was all about sharing with others in situ about how each stakeholder aims to help protect and restore the Kaimai Catchment. 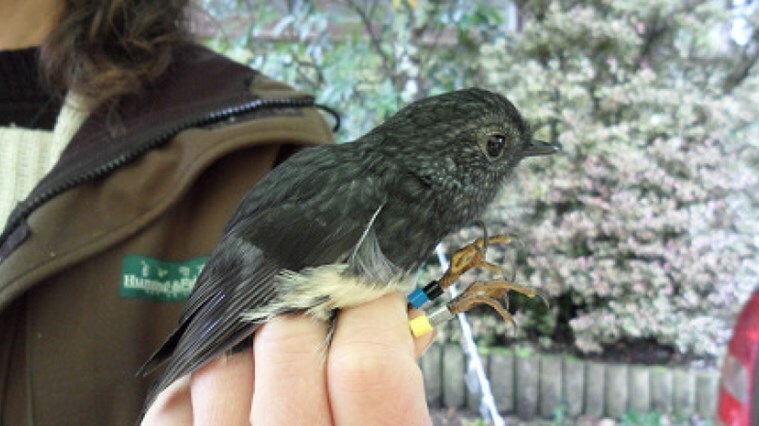 Project Island Song aims to strengthen the dawn chorus in the Bay of Islands, through rigorous restoration and predator control. At the heart of this project is a tremendous bunch of people. I spent a morning filming at Te Rawhiti marae, at the nearby wetlands with John Booth, and a whole day on Urupukapuka Island with volunteers. I was immensely inspired by DOC Community Relations Ranger Fleur Corbett, who spends a lot of her spare time (i.e. evenings and weekends) working on the project. Day 9 – Day off! In the morning I joined a group of young Aucklanders and international tourists who were busy tending to young plants at the Mt Eden native plant nursery. 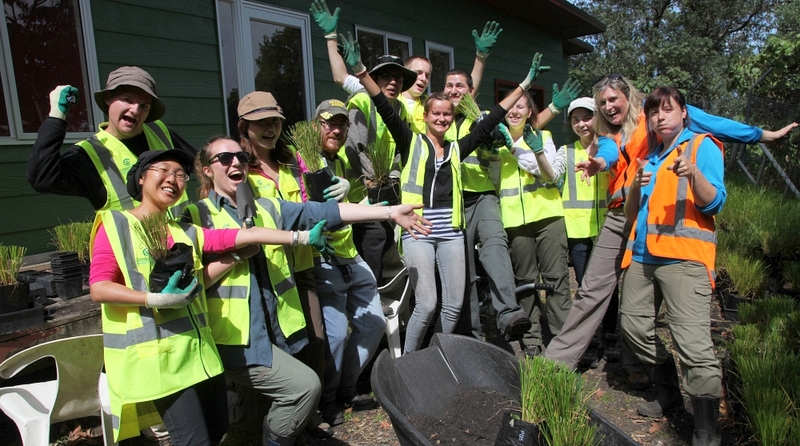 Through their partnership with Auckland Regional Council, Conservation Volunteers NZ provides opportunities for urbanites and visitors to help look after regional parks, and have fun with like-minded people at the same time. In the afternoon I met 15-year-old Nadine Tupp of Warkworth. 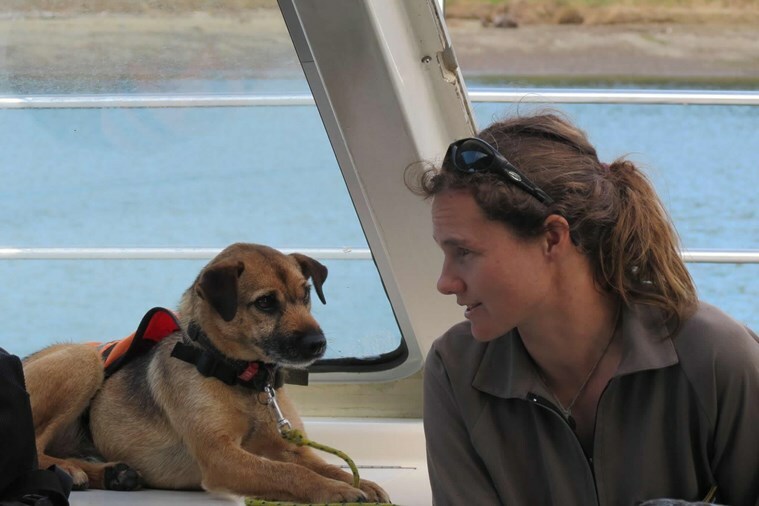 Nadine recently took part in a MAD Marine course, which inspired her to take action. She now writes a blog that highlights some of the threats faced by our beautiful seas, and actions that everyday people can take to minimise these. Thanks to Helen Rowlands and Trish Irvine who made this all come together on very short notice. 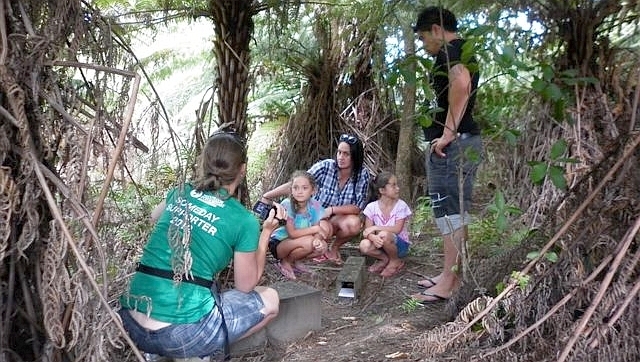 Conservation Volunteers NZ wants everyone to get involved! The above stories will sit alongside others that I’ve already filmed in Otago and Southland—including Orokonui Ecosanctuary, Mitre 10 Takahe Rescue, and the St Clair prion fence in Dunedin. Thanks so much to the DOC Community Outreach Coordinator network who made me aware of all these amazing projects in the first place—and Siobhan File my partner in crime. Project Island Song is on its way! 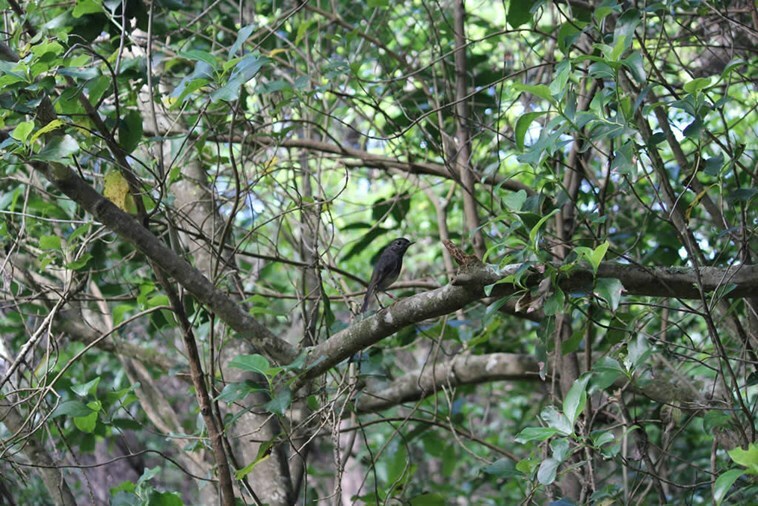 Now that all the stoats and rats have gone from the eastern Bay’s islands, the Guardians of the Bay of Islands, a local community group, can get on with the job of planting trees and bringing back the birds. Here I am (middle left) with Guardians of the Bay of Islands volunteers and families in front of the newly revamped Project Island Song Centre, in Otehei Bay on Urupukapuka Island. Lots of hard work was done that weekend bringing light back to a cold grey building. The launch of the centre is today – just ahead of Conservation Week. 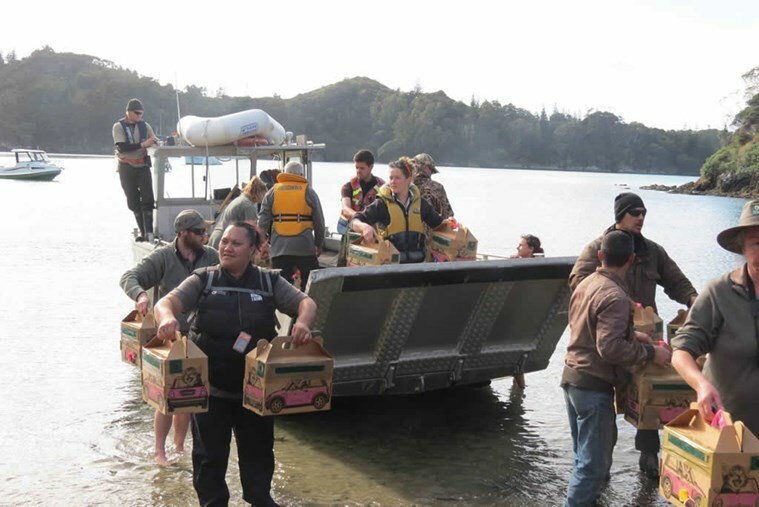 Over a hundred people including kids from three local schools, kaumatua and kuia from the local community as well as DOC and ExploreNZ staff and others passionate about restoring the islands, will be helping to celebrate this occasion. The Centre, staffed by Guardians volunteers, will be opening at Labour Weekend. So come and visit! But before you leave the mainland, you can do your bit to keep these islands pest-free – please stop, check your gear for pests (rats, mice, stoats, ants, weed seeds) and then go!